Roku started rolling out the release of its screen mirroring feature so you can share what’s on your screen from select Windows 8.1 and Android devices. Roku recently started rolling out the release of its screen mirroring features so you can share what’s on your screen from select Windows 8.1 and Android devices as well as Windows Phone. The feature is currently available to users in the US and UK only. Note: This new feature is in beta and only applies to the Roku 3 Model 4200 and Roku Streaming Stick HDMI Version Model 3500. Also, you need a compatible Android or Windows 8.1 device. You can find a full list of currently supported mobile devices here. 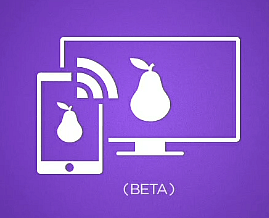 To get everything rolling, go to Settings > Screen Mirroring (beta) on your Roku and make sure it’s enabled. Of course, also make sure both devices are on the same Wi-Fi network. If you don’t see it for some reason, go to Settings > System Update > Check Now. 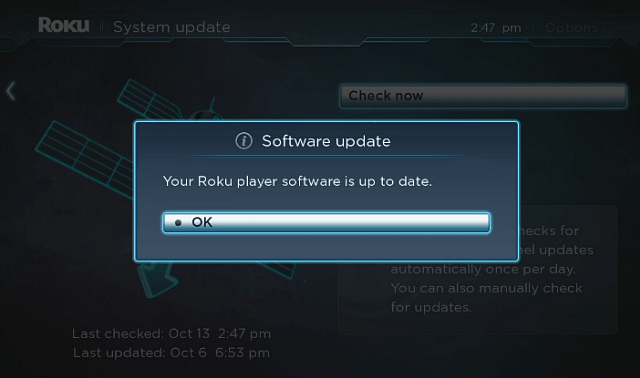 Your Roku should be updating itself periodically in the background, but if you’ve had it unplugged or not connected, you might have to manually update it to get the mirroring feature. If you have a compatible Roku streaming stick or set-top box and a supported mobile device, then you need to download the Official Roku Mobile App. 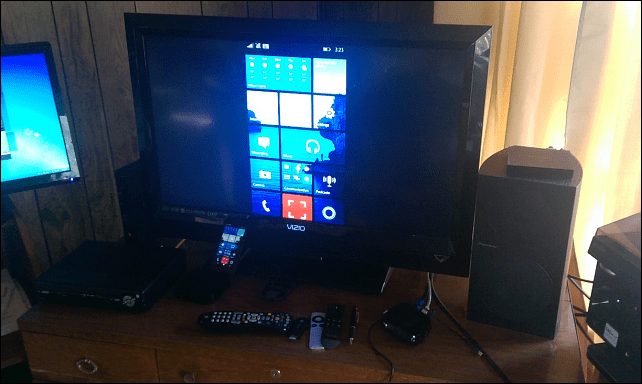 In this example I am using the Nokia Lumia 635 and once you have the Roku on, set your screen to project to it. To do that, go to Settings > System > Project My Screen. 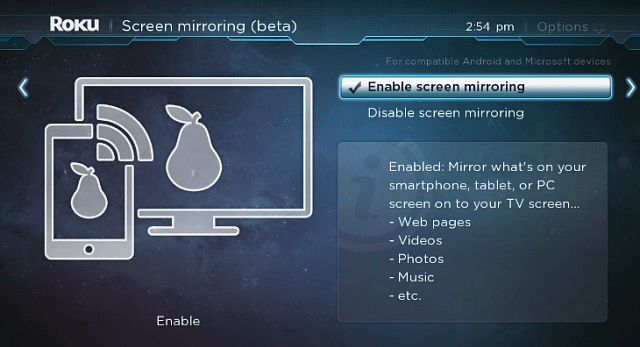 Next it should find the Roku and to start mirroring your phone, just tap on its icon. Here are a couple of shots of it working on my home set up – the pictures aren’t the greatest, but proves it does work. I was able to mirror everything on my screen, but in the first example I am mirroring the Windows Phone, I haven’t had a chance to test Android or a Windows 8.1 device yet, but I am sure the results are similar. 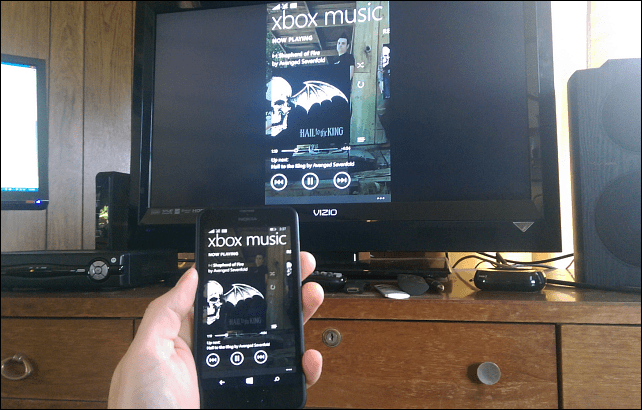 And here is an example of mirroring Xbox Music on the big screen – and yes. All audio comes through as well as the images. Give it a shot if you have compatible devices and let us know what your experience is like! Remember this is a beta, so you can expect some bugs and glitches. For example, each time my phone’s screen would timeout, I would need to reconnect. Kind of annoying, but still something to play with in the living room if you have the time. Enjoy! I was in Bestbuy about 3 years ago and ALMOST bought a Roku…. I got an Apple TV instead. Do you have both Brian? Which do you prefer? I’m guessing Roku is using some sort of Miracast which is what Microsoft uses I think…? @Shockersh: Yes, I have both. In fact I have pretty much every set-top box there is, and of course the Chromecast. Roku uses Bluetooth for some things, like on the Roku 3 the remote has earbuds that you can plug into it, and it uses it for that. But good luck finding one, and on ebay they go for nearly $200 already jailbroken. I’ve tried several different Miracast devices w/Windows 8.1. So far, so bad. Really hoping Microsoft nails it with its device. Thank you for the great article and the additional information. I’m checking into these presentation options for our educators to use in classrooms. Now I have some more reading to do. My favorite example is the Avenged Sevenfold image! 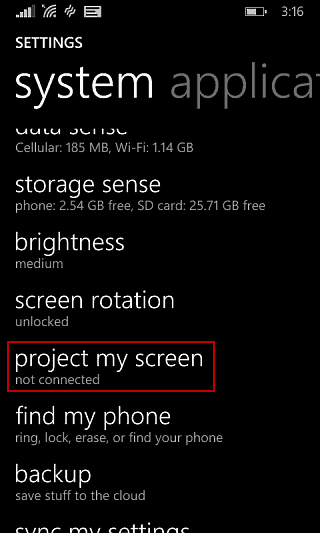 That is exactly what I would want to project from my phone! Nice. Yeah, I am a rock/metal guy.